NEW DELHI (Reuters) – Spirituality, politics and tourism: welcome to the Kumbh Mela, the world’s largest gathering of humanity, that begins next month in India. During the Kumbh Mela, to be held in Prayagraj in Uttar Pradesh, millions of pilgrims including naked, ash-smeared ascetics, will bathe at the confluence of the Ganges, the Yamuna, and a mythical third river, the Saraswati. Organisers are erecting temporary bridges, 600 mass kitchens, more than 100,000 portable toilets, and vast tents, each sleeping thousands of pilgrims at a time, in a pop-up city on the banks of the two rivers. And yet, based on tradition, there shouldn’t be quite such a giant event next year – which is where politics and tourism promotion comes in. The Kumbh Mela is traditionally held every three years in one of four cities along India’s sacred rivers, with one of the largest of those in Prayagraj. The next Kumbh Mela, meaning “festival of the pot”, was due to be held in the city in 2025. But with a general election due by May in which the ruling Hindu nationalist Bharatiya Janata Party (BJP) faces a tough contest, the northern state of Uttar Pradesh has transformed a smaller Ardh, or “half” Kumbh Mela, into a full version of the festival. The BJP controls both the federal and the Uttar Pradesh governments. 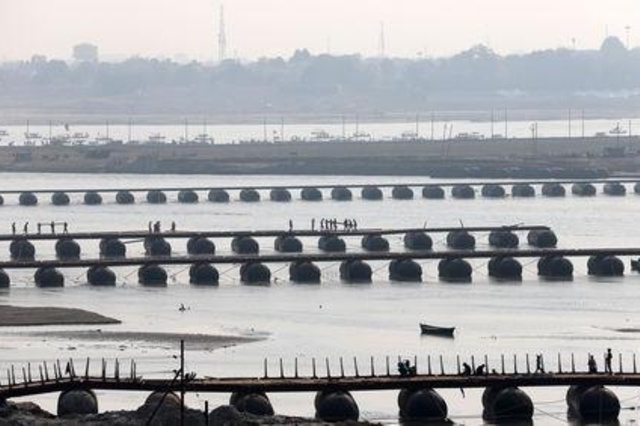 And this “half Kumbh” may by some measures end up being one of the biggest Kumbhs yet because of the state’s massive promotional efforts, especially as Prayagraj – which until recently was known as Allahabad – is seen as the holiest of the four sites. Besides the upcoming election, the promotion coincides with an international charm offensive to improve the image of Uttar Pradesh, India’s most populous state of more than 220 million people with a reputation for poverty and violence. But the state’s chief minister Yogi Adityanath, a Hindu monk who is close to Prime Minister Narendra Modi and has an eye for publicity, has also been driving support for any event that celebrates the dominance of Hindu culture in India, and marginalises the nation’s Muslim minority. It was Adityanath who in October renamed Allahabad, a city of six million where there are nearly 800,000 Muslims, as Prayagraj, from its ancient name of Prayag meaning “place of sacrifice” in Sanskrit. Allahabad is a Muslim name given to the city by a Mughal emperor in 1575. “It is part of a Hindu nationalist agenda and is very worrying to us,” said Zafaryab Jilani, a senior member of the All-India Muslim Personal Law Board, that liaises with the government on Muslim affairs. Neither side is expecting tensions to lead to violence during the festival, although a stampede at the last Kumbh Mela held in Allahabad in 2013, as it was then known, killed 42. “Muslims have always respected the Kumbh. We will not challenge it in public,” Jilani said. Officials do not expect clashes either, but have boosted the number of police on duty compared with previous events. Officials say the festival won’t be a “half” event by any means. “This is the way we are taking it forward. There is nothing which is half,” said Awanish Kumar Awasthi, a senior official in charge of tourism in the Uttar Pradesh government. The state government has promoted the Kumbh Mela at several tourism expositions in Europe, and has invited representatives of every country in the world to attend. Last Saturday, foreign diplomats visited Prayagraj to witness the set-up.